So, somehow I ended up on the planning committee for the women's retreat at my church. Another chronic non-participator on the committee thinks we were invited to be on the committee just to get us to go. I think I might agree. That's not really the point of this post, but it's noteworthy. I'm in charge of food, so I decided to make some cookie dough balls to bake at the retreat, for our lunch dessert. This was a good opportunity to try a cookie I don't normally make: white chocolate macadamia nut cookies. I don't often think about these cookies, but whenever I eat a high quality one, I think to myself, "Mmmm...why don't I make these more often?" The problem is the availability of reasonably-priced REAL white chocolate. Don't even suggest I use those "white baking morsels." They end up scorched and hard in cookies. Uh-uh. I refuse. 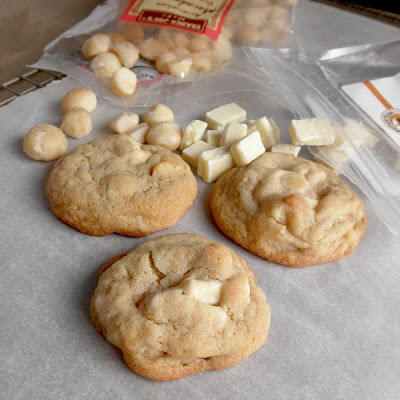 So, when I had $150 gift card to the King Arthur Flour website, I decided to go ahead and spend $9.95 of my money on a pound of Barry Callebaut white chocolate chunks. Next, I found a recipe at my favorite recipe site, allrecipes.com. I read the reviews and followed some of the reviewers' suggestions, and came up with the recipe below. 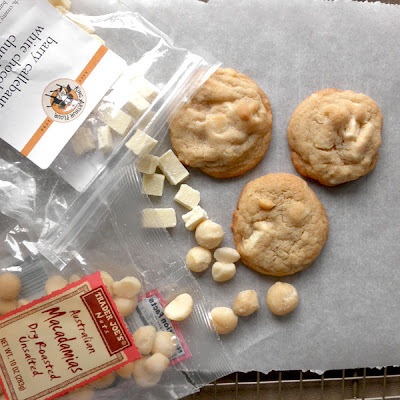 The white chocolate chunks are FANtastic, and the cookies are perfect. I think I'll be making these cookie again (especially since I have some of those expensive chunks left). Oh, and a special note about macadamia nuts: be sure to taste one before adding them to your cookie dough. There's nothing worse than wasting expensive white chocolate by baking it into cookies with rancid nuts. Ugh. Believe me, I've done it. Taste the nuts first. Actually, that's probably a good rule to follow with all nuts. Once you know they're good, seal up the leftovers and freeze them. That's your best bet. Bake for 8-10 minutes in the preheated oven, or until puffed and golden brown on edges. Cool on a wire rack. Store in an airtight container. I love most biscuits. At least, the kind I get at restaurants, like KFC or Popeyes. The best, though, are the biscuits served at Knott's Berry Farm's Chicken Dinner Restaurant. Oh my goodness. They are soft and tender on the inside with a super-fine crumb; dark brown, chewy and a little crisp on top; and crisp and slightly greasy (yes, greasy) on the bottom. Put some butter or some boysenberry jam in the middle and you're pretty close to heaven. Seriously. 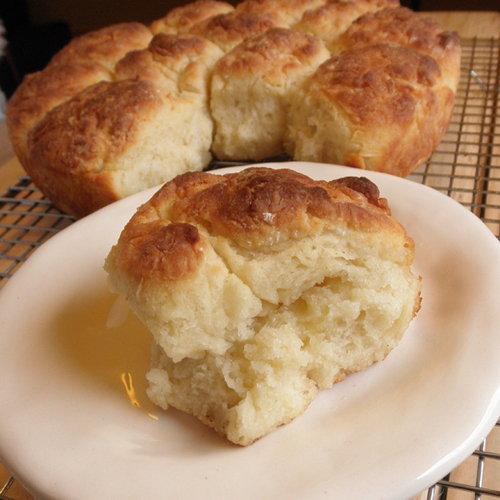 I can't say that the recipe below tastes just like the Knott's biscuits, but they're close enough for me. Very moist and tender on the inside with a nice buttery, chewy browned top and a nicely browned bottom. I love mine with butter. Plenty of butter. The recipe comes from Cook's Illustrated Magazine. One of my favorites. My copy of the issue that this recipe comes from (July & August 2004), is grease spotted with a bit of crusted batter here and there. I've scanned it and PDF'd it to save on my computer, but it needs to be blogged about. So here it is. Thank you, Cook's Illustrated, for all of your awesome contributions to the culinary world. I love you. 1. Adjust oven rack to middle position and preheat oven to 500 degrees F. Generously butter an 8 or 9-inch round cake pan. Set aside. 2. For the dough: In a large bowl, whisk together flour, baking powder, sugar, salt, & baking soda. Add butter cubes and cut in with a pastry blender until mixture resembles pebbly, coarse cornmeal. Add buttermilk and stir with rubber spatula until just incorporated. Dough will be wet and lumpy. 3. To form and bake biscuits: Using a large spoon, scoop up about 1/4 cup and scrape dough blob off with a rubber spatula onto the flour-filled baking sheet. Start with about 3 or 4 blobs. Dust tops of blobs with some of the flour and toss gently with floured hands to coat blob with flour. Gently shape each blob into a rough ball, shake off excess flour, and place in prepared cake pan. Repeat until the dough is used up, arranging 9 biscuits around pan perimeter and three in the middle. 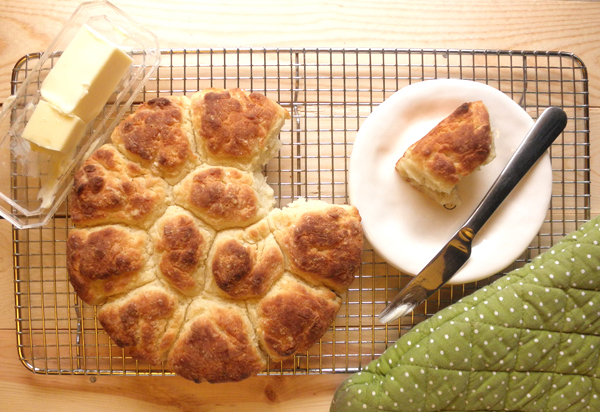 Brush or spoon melted butter on top, taking care not to flatten the biscuits. Bake 5 minutes at 500 degrees, then reduce oven temperature to 450 degrees and make until biscuits are a deep golden brown, about 12-15 more minutes. (I usually check at around 12 minutes, move the pan to my baking stone on the bottom rack of my oven, and then bake for another 3-4 minutes.) 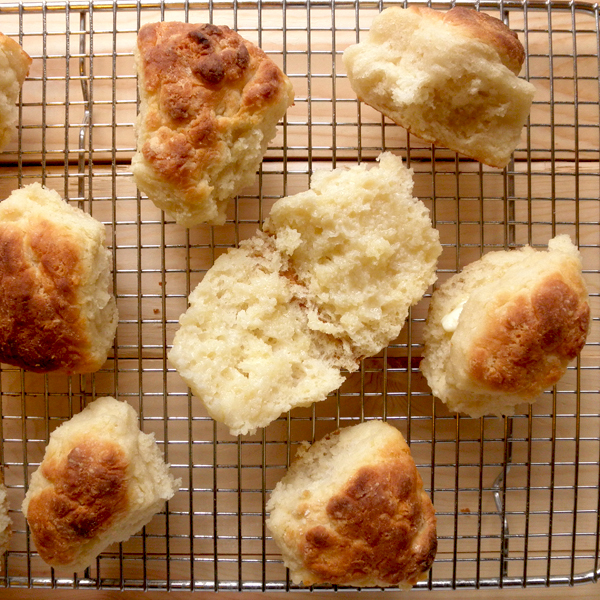 Cool in pan 2 minutes, then invert biscuits from pan onto clean kitchen towel; turn biscuits right side up and break apart. Cool 5 minutes longer and serve hot. *These freeze well wrapped in foil and sealed in a zip-top bag. Reheat in foil in a 350 degree oven for about 15-20 minutes, or until heated through. 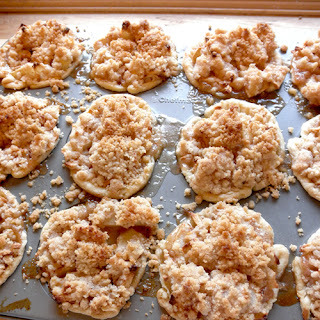 I am just crazy enough to want to make apple pie and then decide to make mini pies instead of a whole pie. Why mini? 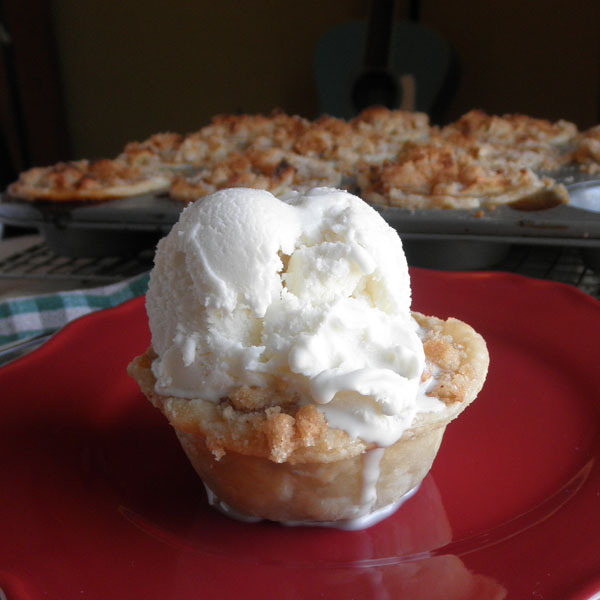 Because it looks so much neater and cuter than a slice of pie. Plus, I wanted to see if I could pull it off. And I wanted to blog about it. Fortunately, these mini pies have proven to be a great success. Cute, crusty, sweet, tart, absolutely delicious. The fact that I ate two of them attests to their greatness. For me, the best part of a pie is the crust, so this little pie has plenty of it. The crust to fruit ratio is about 1:1, which is how I like it. If you're not that much of a fan of crust, this recipe may not be for you. If you decide to attempt these, make sure you give yourself plenty of time for the task. Maybe it's just because I decided to make these on a weeknight, but it felt like they took a long time. They were well worth it though. I think the picture shows that. 2/3/14 Update: I made these again just because I was craving Dutch apple pie, but I didn't have enough people to help me eat them. I placed the uneaten mini pies on a wax paper-lined cookie sheet and froze them until solid (about 3 hours). Then I wrapped each in wax paper and placed the frozen mini pies in a large freezer zip top bag and kept them in the freezer. I just heated one in a 300 degree oven for about 20 minutes, and it was perfect. I still have about six in the freezer just waiting for me. I must pace myself. In a large bowl, mix flour and salt. Cut in butter until mixture looks like sand. Cut in vegetable shortening until mixture has chunks the size of peas. Slowly sprinkle 6 tablespoons cold water over mixture while tossing with a fork. Squeeze some in your hand. If the dough does not bind nicely when squeezed, add the other tablespoon of water. Toss. Form dough into a uniform ball. Between two floured sheets of plastic wrap (you might have to double up and use four sheets), roll dough to about 1/8 inch thickness. Cut out 18 circles that are 4 1/2 inches in diameter (I had to use a glass lid for a mini cake stand for this). Gather and re-roll dough after the first round to get your 18 circles. Fit dough circles into non-stick muffin pans, pressing sides and folding a little as needed. Press any overlap over the edge and crimp with a fork. (I used one 12-cup muffin pan and one 6-cup muffin pan.) Place prepared crusts in refrigerator while you prepare the filling and the topping. Slice apples to 1/8 inch thickness. Julienne some of them, and cut others into approximately 1/2 inch trapezoids (you know, whatever that shape is you would get if you slice a slice perpendicularly). Mix the half cups of flour and sugar with cinnamon in a medium sized bowl. Slice the 4 tablespoons butter thinly and add to dry mixture. With fingers, mix in the butter until it’s evenly distributed and you have a nice sandy-looking crumb mixture. Remove crusts from refrigerator. 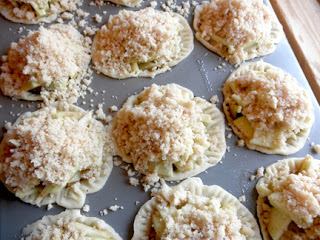 Stir apples and scoop mounds of them into prepared crusts. Work as many apples into the cups as you can, shifting and gently pushing. Once cups are all filled, place one small chunk of butter on top of each and then carefully top each with a generous tablespoon of topping. Line the bottom of your oven with a large piece of heavy duty aluminum foil to catch any dripping juices. Place muffin pans in oven and bake at 400°F for 30-35 minutes, or until juices bubbling out start to thicken. If the topping is getting too dark before this thickening happens, lightly cover pies with aluminum foil. Remove from oven and allow to cool almost completely before removing from muffin tins. You might want to run a knife around the edges to make sure they’re not stuck, which hopefully they won’t be if you used a good non-stick pan. They look sticky, but with a little coaxing, they came out fine. So, I'm half Chinese and I don't like Chinese food. I like certain Chinese foods if I make them, and I think that's just the control freak in me showing herself. Egg rolls and fried rice are the two Chinese foods I love. My white mother made this yummy fried rice all the time, and I think I like it because it's got what I would consider a western twist on it: bacon. The more bacon on top the better. My son will eat the bacon first, and then the rest. Come to think of it, I might have done that as a kid too. This is a good recipe to use leftover sticky rice. Or if you have a pound of bacon burning a hole in your fridge. It's just good. Try it. Cut raw bacon into 1/2 inch pieces. Fry bacon bits in a large frying pan with relatively high sides on medium high heat, until as crisp as you like your bacon. Remove bacon bits with a slotted spoon to a paper-towel lined plate. Drain all but about 2-3 tablespoons of the bacon drippings from the pan. Turn heat to medium and put rice in pan, breaking up any big chunks. Stir to mix rice into the bacon grease. 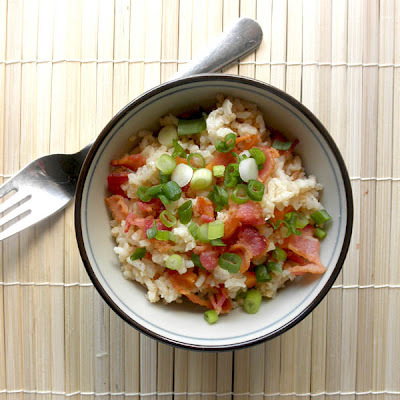 While rice heats up, whisk the egg and soy sauce in a small bowl and then stir into the frying rice. Fry & stir until you can no longer see any shiny egg. Turn heat to low, and cover while you prepare the carrots and green onions. Microwave the carrots in a covered microwavable dish with about a tablespoon of water for about 1 minute. Stir carrots into the rice. Top rice with bacon bits and green onions. Serve hot.